Extra-Large Size Denim Items, How to Recycle Them? Every textile recycler aims to achieve zero waste. The ultimate goal is to prevent every garment from going to landfill. That is not always an easy task. For example, denim jeans are donated to your organization. 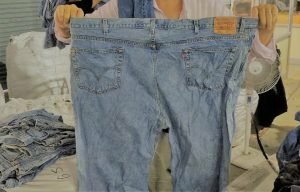 You extend the life cycle of these jeans by putting them up for sale in your thrift store. However, not all denim will sell. In fact, not even all denim jeans leaving your warehouse in the blend of baled mixed rags are able to be sorted for reusing by customers in other marketplaces. On average, only 60% of denim is sold in second hand markets. The reason: a large portion of used denim jeans from America are between size 36 and 44. 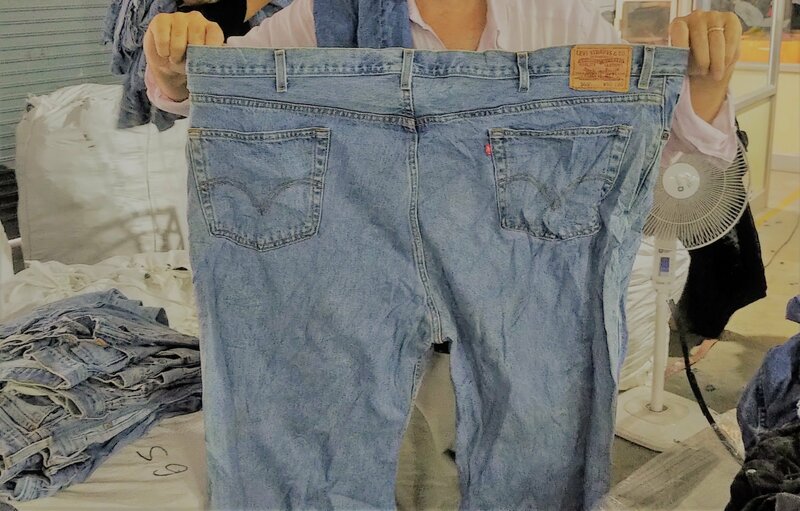 The reuse ability in traditional aftermarkets is limited for the extra-large jeans because consumers overseas wear smaller sizes. What does this mean for the circular economy of denim? We need a solution to keep the other 40% of denim out of the landfill. Volunteers are generally a welcome addition to the paid staff at a thrift store or thrift warehouse. Sometimes they are a liability though, including theft, on-the-job injury, and other personnel issues while working with regular employees. Therefore, consideration must be given to interviewing them as you would a regular employee: Learn about their past employment record, and perform a background check as you would for your regular employees. Keep in mind that training for their specific job is necessary as well as guidance provided by an employee. And remember that providing positive feedback for a job well done goes a long way toward maximizing productivity in both employees and volunteers. Be the store or warehouse where good volunteers want to work! Traditionally, a big share of used purses and belts ends up in Haiti via Miami. Unfortunately, a strong dollar together with the political instability Haitians are living through nowadays, are slowing down the trade of used goods. Luckily, there is a big demand for these products in other export markets. As a warehouse manager, the only thing you will have to do is to load the purses and belts into capsacks. That way, you maximize the load weight and your revenue. The Bank & Vogue Team wish you Happy Holidays. Thank you for choosing the Rag News to keep you informed this year. We look forward offering you more of the best in the industry in 2019.